Don’t they look focused on their work? Also at the conference, I did my first book signing (in the Annie’s booth) on Thursday night, during the Shopping Floor Preview. I should have a photo of that soon (hopefully). It was a lot of fun and I will probably do it again at the CGOA Conference in Charlotte, NC in October of this year. I signed my new “Jewelry to Crochet” book, published by Annie’s, that I blogged about on June 30th. The folks from Annie’s were giving copies of my new book away during the book signing. I met many nice ladies (and a few men, too) at the book signing. From left to right are Phyllis Nabakowski, Beth Hall, Jane Rimmer, Kathryn White, me (Susan Lowman), Linda Dean and Patti Giorgi. We have 2 levels of portfolio reviewers (junior and senior) and each portfolio is reviewed by 2 reviewers (one from each level). 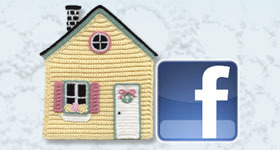 To find out more about the CGOA Masters program, check out the CGOA website here: www.crochet.org. 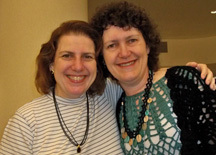 On Wednesday, Jane Rimmer and I went to the TKGA (The Knitting Guild of America) Masters Day, which was an all-day event. We took this day to find out how TKGA runs their Masters Day so we can put on a CGOA Masters Day at the CGOA Conference next year. It was time well-spent! We learned a lot and will be starting to prepare for our very first CGOA Masters Day soon. From left to right are: Donna Stinson, Terri Geck and Bobbie Matela (who I met years ago and enjoy seeing each year at the conference). This is Shari White, who is my first mentee in CGOA and my roommate at most conferences. 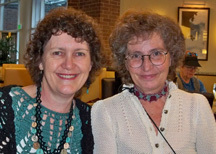 This is Kathy (Kathryn) White, who I met at the CGOA Conference in 2011 in Greensboro, NC. Kathy lives 2-3 hours away from me, in Arizona, but it took going to the conference in NC to meet her!!! 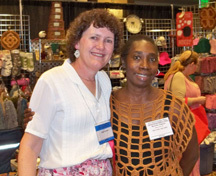 This is Marcella Clayton, who I met in the Crochet Pattern Writing class I taught on Thursday. Marcella showed me her design in class and I encouraged her to show it to an editor at the Meet & Greet on Saturday morning. Needless to say, Marcella sold her first crochet design that morning! Go Marcella!!! On Saturday morning, we had the Board meeting at 7AM (I’m sure glad I’m a morning person!). It went well and we got a lot accomplished. I can’t tell you what we discussed because it’s still a “secret”! But all will be revealed in time. On Saturday night, we had the first ever “CGOA Fun Night”! It was great!!! Amy Shelton, of Crochetville, was the emcee. We had “Show and Tell” throughout the room. We also played “Let’s Make You Squeal”, where Amy called out an item’s name and the first person who had that item in their crochet bag (or purse) squealed with delight to win a prize. There were lots of prizes given out that night, as well as prizes at the Member Meeting and the Fashion Show Dinner (we love prizes in CGOA!). We also love all the goodie bags filled with fiber goodness that are donated by many sponsors of the CGOA Conference. A big “thank you” to Lion Brand, Red Heart and Annie’s for the fabulous goodie bags! We really appreciate your support of the CGOA Conference! On Sunday afternoon, the conference was over (boo hoo!). But I made lots of fabulous new memories of fun times with lots of wonderful people. I always feel so energized after a CGOA Conference! If you’ve ever thought about attending a CGOA Conference, you really should. It’s almost a week of fiber-loving events spent with like-minded people. We speak the “language” of crochet all week! Everyone is so friendly and encouraging of each other. If you can’t make it to a CGOA Conference, I hope you at least have friends who you get together with regularly to crochet together and encourage each other with your crochet projects. This entry was posted in CGOA, Conferences, Teaching classes, Traveling and tagged Bruges Lace, CGOA, classes, crochet class, Mosaic Crochet, Reading crochet patterns, teaching, wiggly crochet, Writing crochet patterns. Bookmark the permalink.